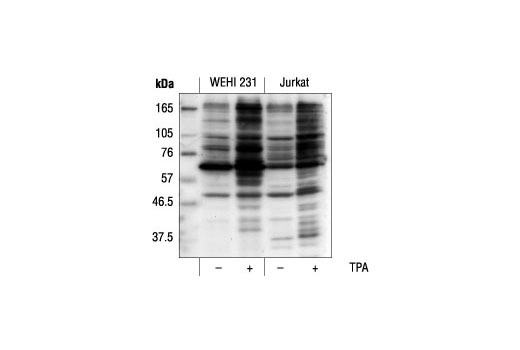 Western blot analysis of extracts from WEHI 231 cells and Jurkat cells, untreated (-) or treated with TPA #4174, using Phospho-(Ser) PKC Substrate Antibody. 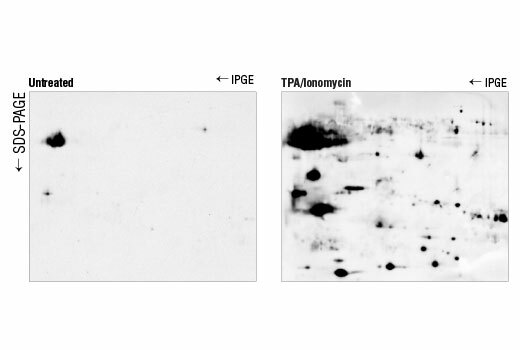 Western blot analysis of extracts from Jurkat cells, untreated or treated with TPA #4174 (50 ng/ml) and Ionomycin, Calcium Salt #9995 (1 µM for 20 min prior to lysis) and subjected to 2-D electrophoresis, using Phospho-(Ser) PKC Substrate Antibody. Polyclonal antibodies are produced by immunizing animals with synthetic phospho-PKC substrate peptides. Antibodies are purified by protein A and peptide affinity chromatography. 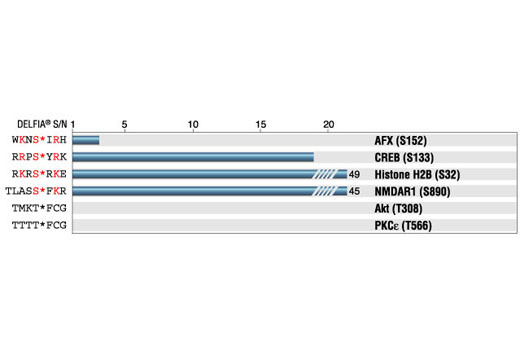 Although protein kinase C (PKC) family members are involved in a number of signal transduction processes including secretion, gene expression, proliferation, and muscle contraction, many PKC substrates continue to be unidentified (1,2). Isozymes of PKC are subdivided into conventional PKCs (cPKC), novel PKCs (nPKC), and atypical PKCs (aPKC). PKCα, βI, βII, and γ isoforms belong to the cPKC group (1). When activated, cPKC isozymes phosphorylate substrates containing Ser or Thr, with Arg or Lys at the -3, -2, and +2 positions, and a hydrophobic amino acid at position +1 (1-3). Obata, T. et al. (2000) J Biol Chem 275, 36108-15.